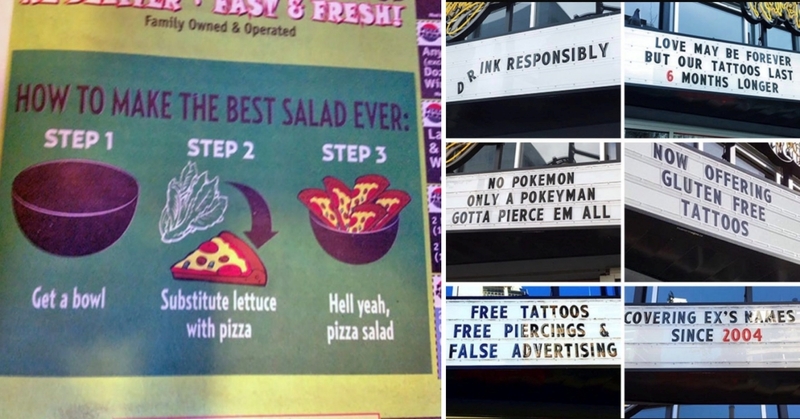 15 Businesses With The BEST Sense Of Humor! Most of the time, when we think of BIG business, the words ‘sense of humor’ don’t really pop up in our minds soon afterwards! 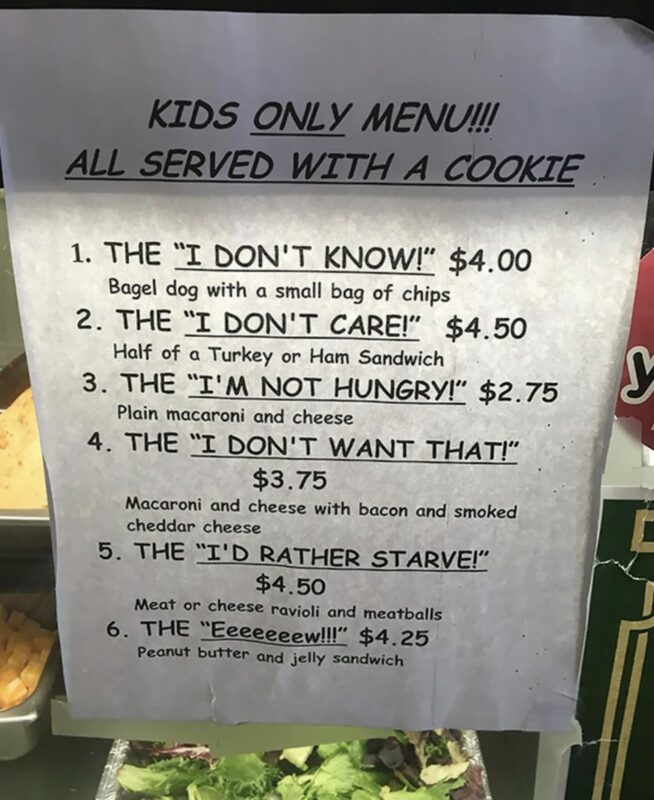 Usually, any business’ main aim is just to take our hard earned money from us (especially, if you’re like me, who makes it easy for them as I have no self-restraint!) Otherwise, they wouldn’t really be much of a business, would they!? But, in this competitive age (where more & more people are setting up businesses of their own! ), it’s important to have a way of standing out, instead of just gauging money from people. 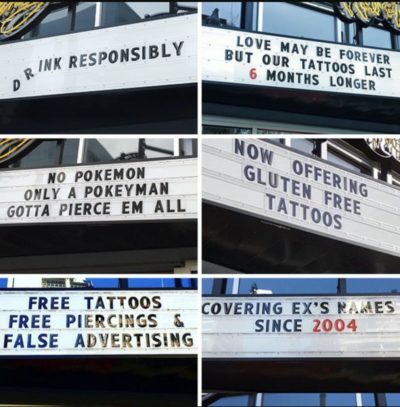 & What better way to stand out than with a mega groan-worthy pun or sassy joke!? As you will soon see with these 15 quirky businesses…THERE IS NO BETTER WAY!!! 1. A little bit of genius! What hilarious brilliance, is this!? 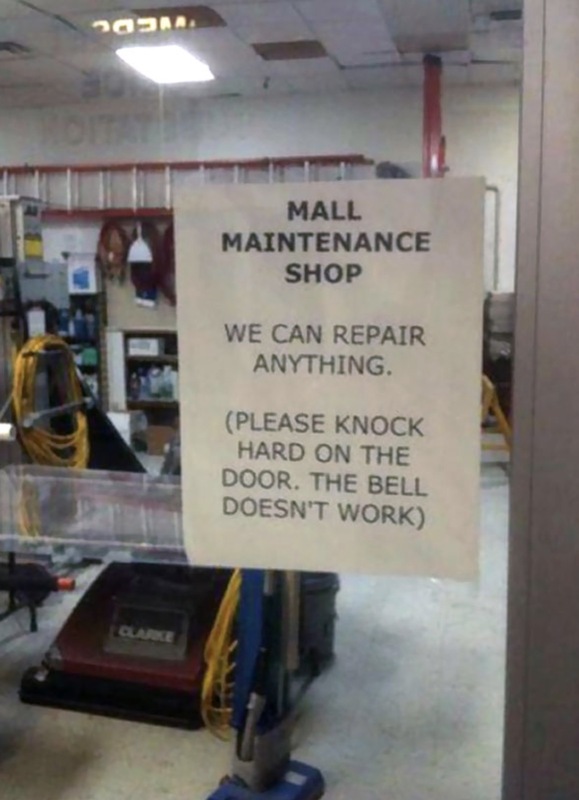 It’ll certainly stop the moaning and fighting whilst also being highly amusing…! 2. Another one bites the dust! Well, it looks like the computer repair shop has got a severe (or you could say…’server’…I’m sorry!) 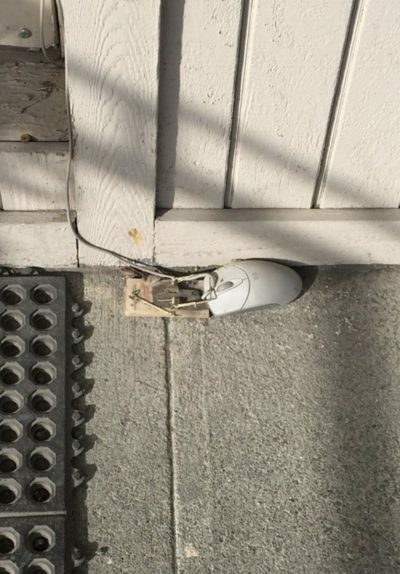 mouse problem! & There’s another victim caught! Poor thing, hope it didn’t suffer! 3. 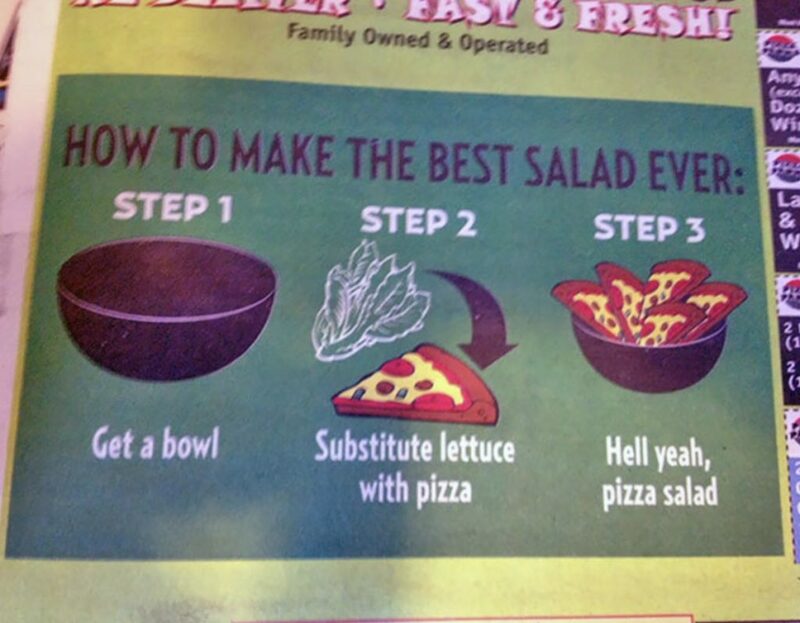 The best salad…in the world! Oh, so that’s how you make a salad edible!? It all makes sense now! Hell yeah, indeed! 5. 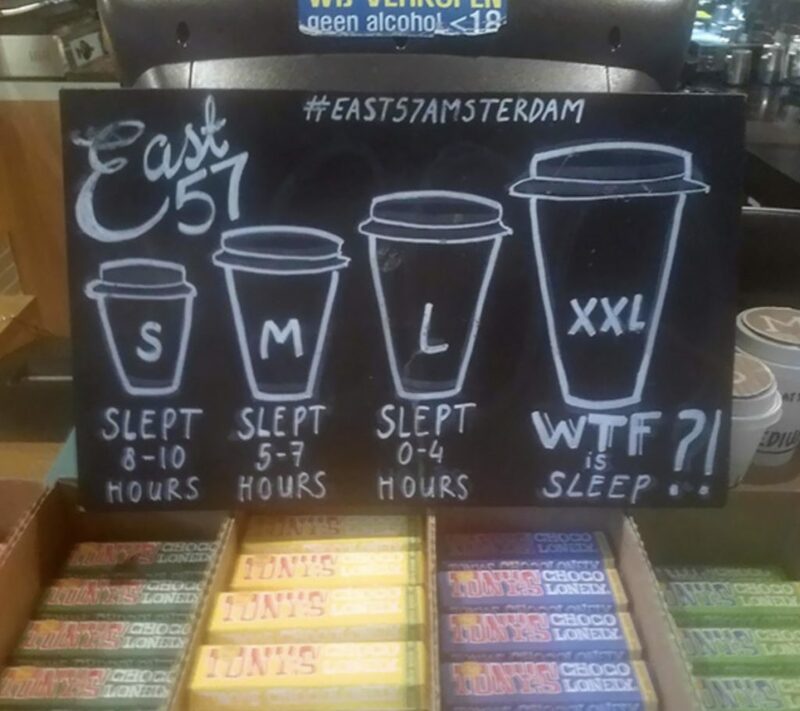 What is this sleep that you speak of!? 6. Not a necessity, but definitely a bonus! 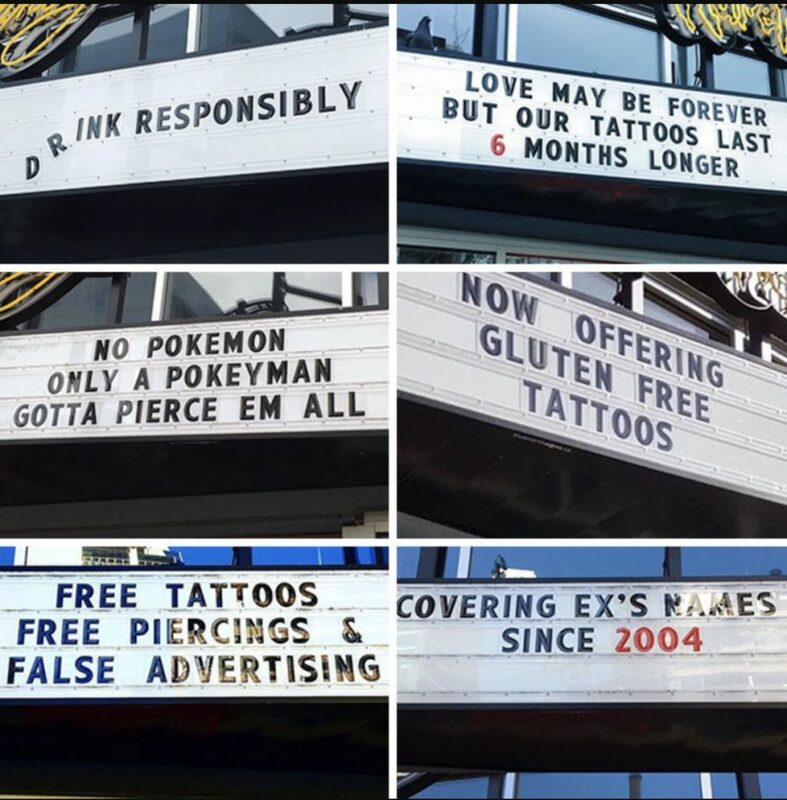 Let’s face it, when we’re having our skin pierced with what feels like a million tiny needles of death, covered in inking splodge, it doesn’t really matter whether or not our tattoo artist has a sense of humour….but it certainly helps! 7. 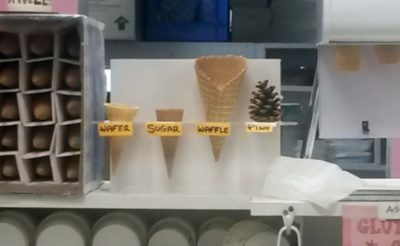 Winter marketing done right! 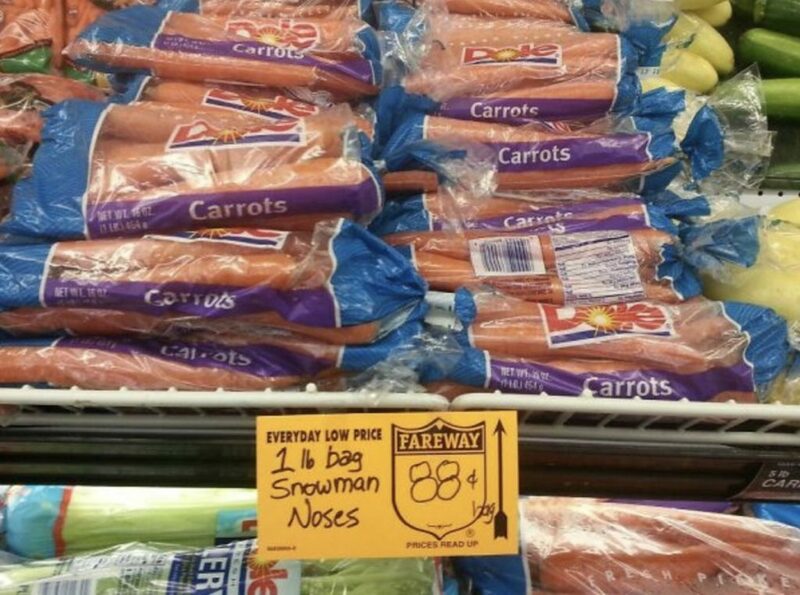 Having trouble getting rid of carrots in winter!? 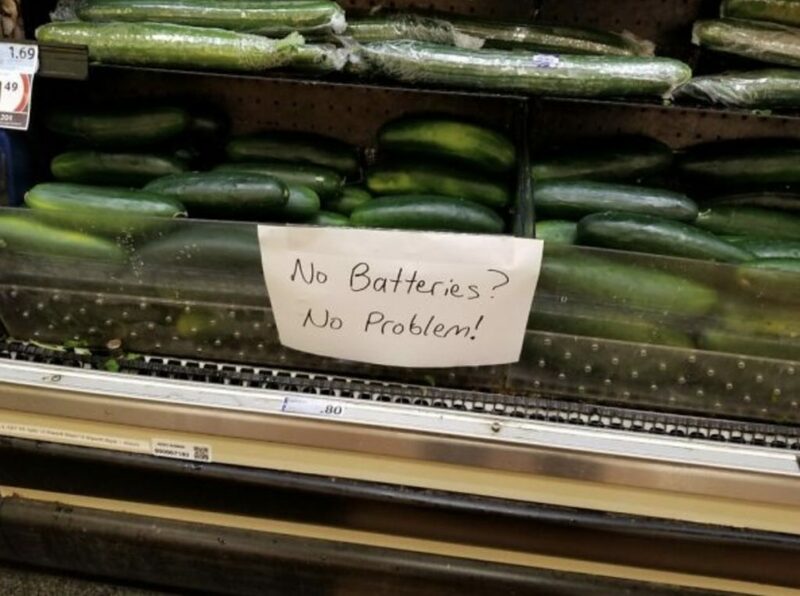 Well, just take these awesome marketing tips from this supermarket! 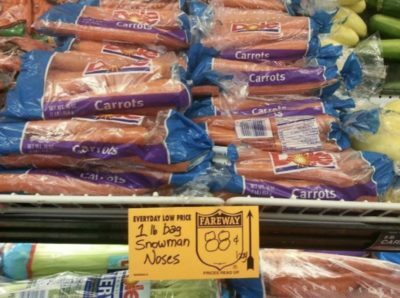 Snowmen always need good sturdy noses in winter, let’s face it! 8. 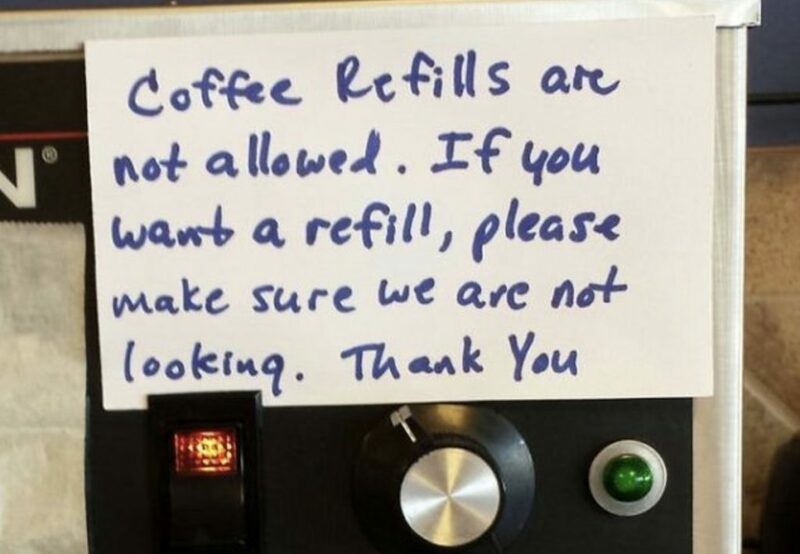 The irony is delicious…. This is hilarious! So, not quite everything then, guys!? Me thinks you may be fibbing, just a tad! I don’t know about pine…more like WHINE! I just rolled my eyes so far back in my head, that I think my eyeballs did a full 360-degree turn! The sign of an excellent pun, well done, sir! 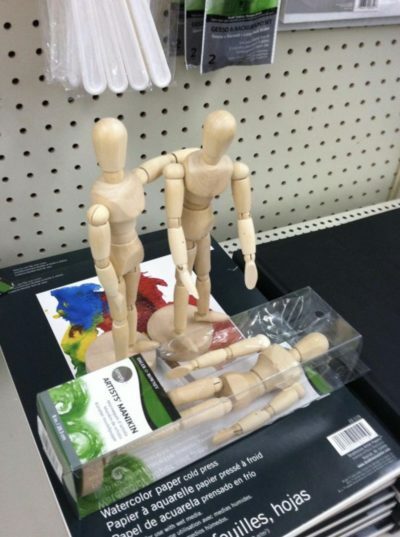 A bit of step ladder family drama going on here at the Hardware store! 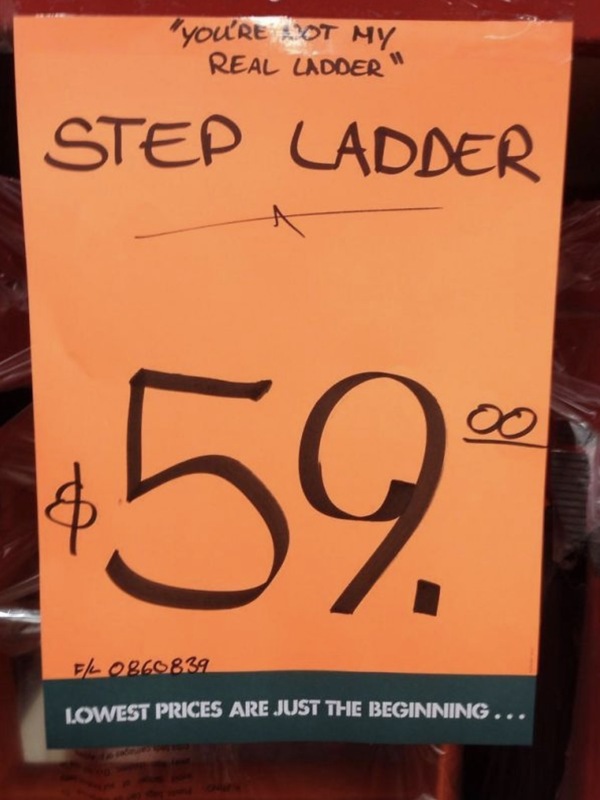 Who knew that ladders could have normal, family disagreements as well!? 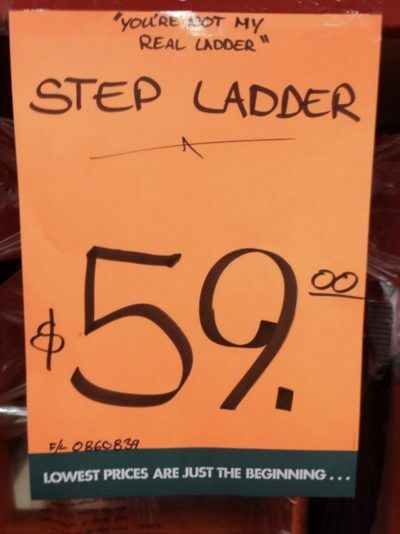 Well, I hope they work it out soon, step ladders just never get the credit that they deserve! 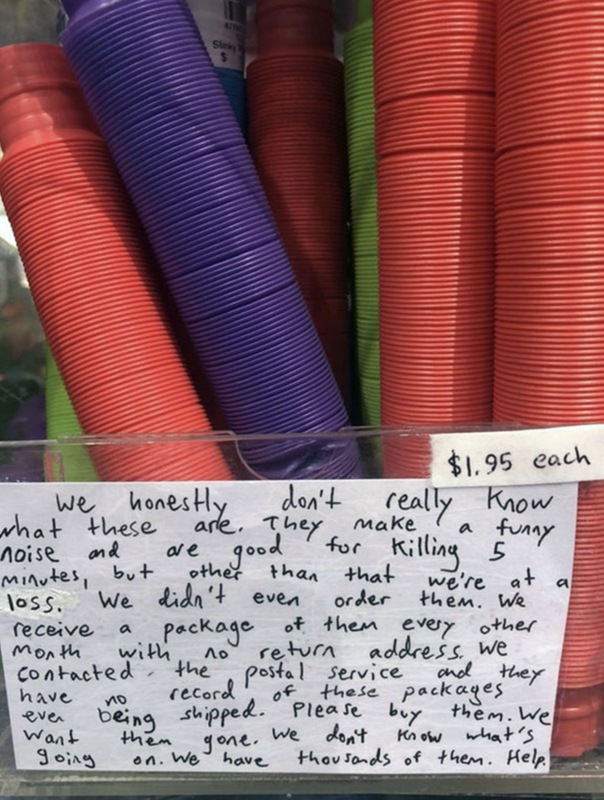 This is just so funny because when you’re first reading it, you’re just laughing at their honesty and then it just gets more and more desperate from there! I need to know what they are now, too! Has anyone any answers for us!? Send them on a postcard! Pronto! Yeah, we really had no idea what true dastardly tricks they were really up to, did we?! 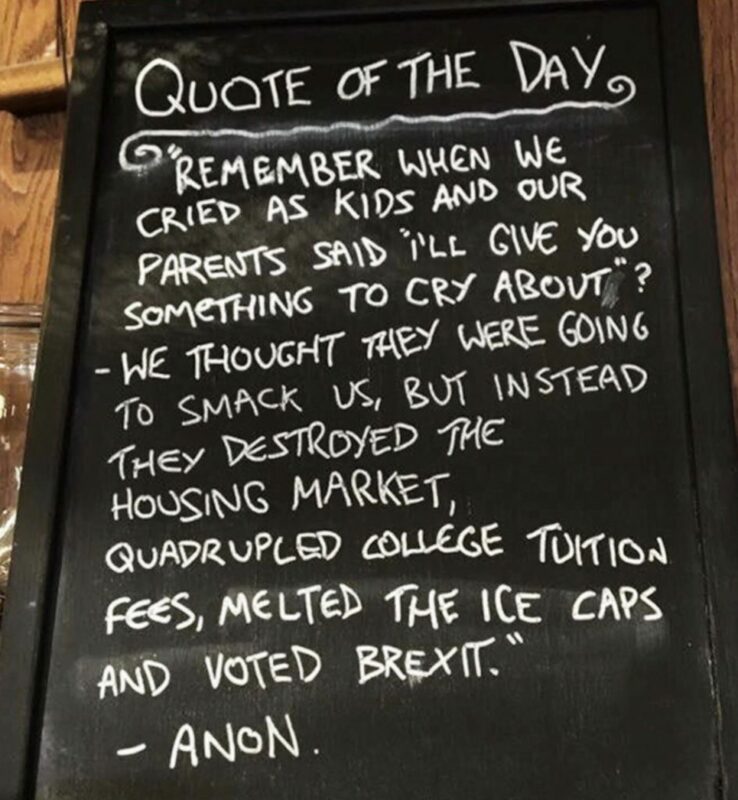 Now we’re all crying…and we’ll be forever crying and so will our children…s0, thanks parents, you really played a blinder on us, there! 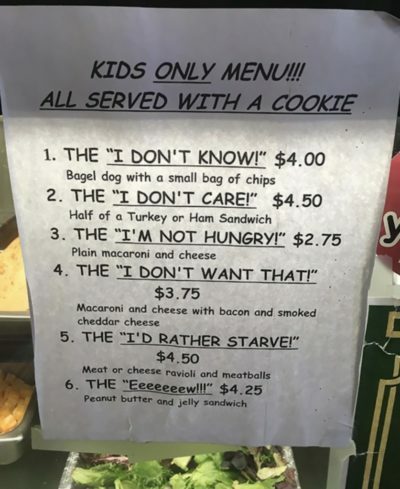 Kudos to this business to serving up a side of harsh truths with people’s orders! 13. Well, what do you know!? 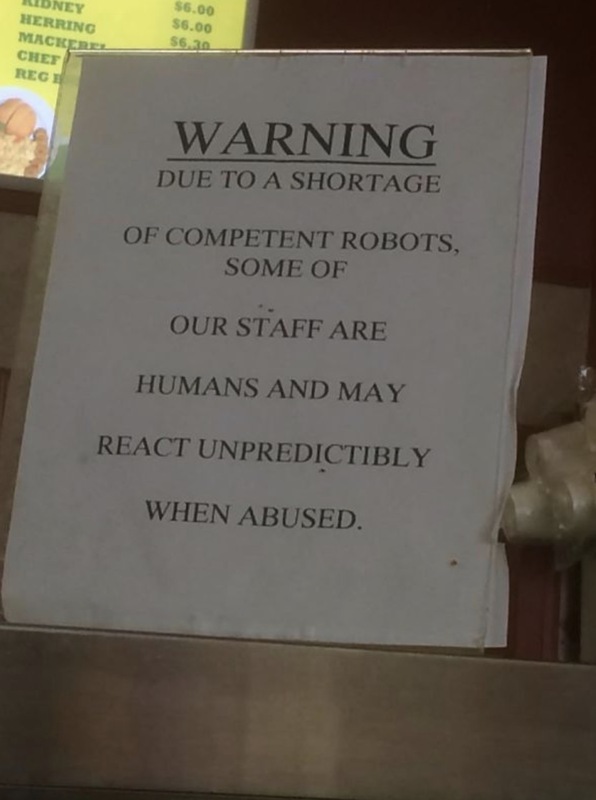 Well, who knew that humans actually had feelings and would be upset when people are horrible to them!? Some people obviously never got that memo! I don’t know whether this business is trying to be really over friendly and helpful, sarcastic, or that they just don’t have any f**ks left! Maybe it’s all three!? Either way, I’m sold! I think I’ll definitely be going here for my coffee in future, so whatever kind of unorthodox marketing it is, it obviously works! Who knew that the produce aisle could be such a dark and seedy place!? (& I don’t mean the seeds that are residing in the fruit!) How embarrassing would it be to walk down this aisle with your grandma, though!? & Even more embarrassing if she bought one! Yikes! What’s the funniest thing you’ve seen a business attempt to try and laugh you all the way to the cash register!? Was it better than these fabulous attempts at humor bribery! ?